The Elizabeth Murphy House is an American System-Built Home designed by Frank Lloyd Wright. In a previous post, we extolled the genius of the shadow-making geometries of Frank Lloyd Wright’s shoe molding design for American System-Built Homes (ASBH). This post serves as a retraction, an update, and a call to fellow ASBH owners and experts to contribute clues to a new mystery. 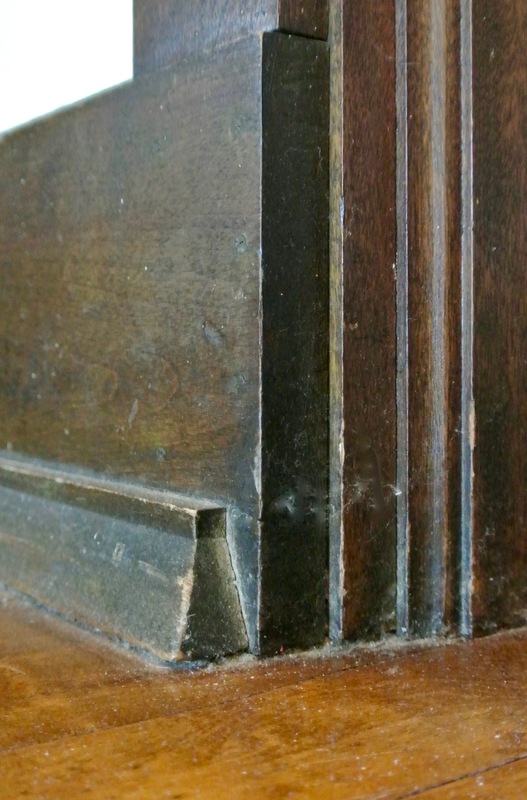 In collected conversations with owners of other American System-Built Homes, we have heard that the shoe moldings were installed in two different ways: (1) with the long edge vertical, as shown in this image, and (2) with the long edge attached to the floor. In fact, new friends Jason and Michael reported during a visit to the Elizabeth Murphy House that they see the molding attached both ways in their Delbert Meier House. We have heard that homes in the Chicago area generally sport the long edge down, and while visiting the AA202 in Madison last fall, we noted that all shoe moldings in it are attached with the long edge up. So one goal during a recent visit to the Columbia University’s Avery Architectural & Fine Arts Library to view ASBH drawings was to understand the original specification and intent for this detail and to try to explain the inconsistencies. 1.) According to the drawings, the shoe trim was number B-11 in the ASBH part numbering system. 2.) No drawing in the Avery collection shows the trim installed with the long edge attached to the wall. Indeed, at least 5 separate drawings show it installed with the long edge down. Here is a sample, from a drawing for the ASBH model E-4. 1.) subcontracting carpenters misinterpreted the architect’s intent and installed as their intuition or experience suggested. This might have happened based on limited instructions passed from Frank Lloyd Wright, his support team or the Richards Company. Finally, we empathize with the men assembling these houses who were faced with these choices while building homes on fixed contracts. Milling angles of the shoe trim suggest that the long edge belongs on the wall side, since the effect is to create a horizontal line. Flipped down, the result is that the shoe trim becomes a dust-catcher, a toe-stubber, and a place where chairs legs would quickly wear damage into the decor. Wright may have thought the visual impact of a wider foundation at the walls and doors was worthy of such compromise. Such would be the risk of leaving some decisions to chance, and, more importantly, of creating an unsupervised system. Do any ASBH owners or experts have additional clues that might explain how these building choices were made? Image Courtesy: Frank Lloyd Wright Foundation Archives : architectural drawings, ca. 1885-1959. The Frank Lloyd Wright Foundation Archives (The Museum of Modern Art | Avery Architectural & Fine Arts Library, Columbia University, New York). As life time carpenter, without instruction, I would have in installed it with the long side up. Also, knowing that Mr. Wright often had ideas out of the ordinary (or practicality) I am not entirely surprised. I need to see what both ways look like in person to make my own final judgement on the aesthetic. I guess I need to visit the Mr. and Mr. in Iowa! We agree, on all points.